A refreshing Shampoo for Normal to Oily hair. Faith in Nature's Lemon and Tea Tree shampoo contains Organic Lemon and Tea Tree essential oils and has an energising, uplifting citrus aroma. 100% naturally fragranced. 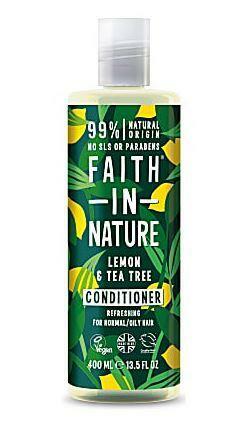 How to use Faith in Nature Lemon & Tea Tree Shampoo; Massage gently into wet hair, rinse well and repeat if required. For best results, follow with Lemon & Tea Tree Conditioner. In case of contact with eyes, rinse with clean water immediately. If irritation occus, stop use. Keep out of reach of children.